RAQA: An ivory-colored rosary swings from the rearview mirror of Abboud Seryan’s pickup truck as he speeds through Syria’s Raqa, inspecting the positions of fellow Christian fighters taking on the Islamic State group. Lively music blasts through the car speakers while the thin 23-year-old, wearing a military-style cap and a revolver tucked into his waist, waves to comrades in the western district of Al-Romaniya. IS was ousted from the neighborhood earlier this month as part of the US-backed offensive to defeat the jihadists in their northern Syrian bastion. The ground assault is being carried out by the Syrian Democratic Forces, a majority Kurdish and Arab alliance, but dozens of Christians from the Syriac sect have also joined the fight. “We’re participating in the liberation of Raqa in the name of all Syrians. There’s no difference between Syriacs, Kurds, or Arabs. We’re all brothers,” Seryan says. The jihadists “blew up Raqa’s churches and forced Christians to convert to Islam. This is also why we’re participating in this battle.” Thousands of Syriac Christians once lived in Raqa alongside Armenians, Kurds and the city’s mainly Sunni Arab population, but many fled when IS overran the city in 2014. On June 29 of that year, IS declared the establishment of a self-styled “Islamic caliphate” straddling areas under its control in Syria and neighboring Iraq. Christians could remain in Raqa if they paid a special tax called the jizya or converted to Islam-but many of them chose to flee. As the fightback against IS intensified the Syriac Military Council (SMC) formed in 2013 to defend the community during Syria’s civil war-joined with the SDF. After a months-long operation to encircle Raqa, the SDF burst into the city on June 6 and are chipping away at jihadist-held districts, with help from heavy US-led coalition air strikes. Now the SMC’s fighters are battling jihadists on the frontline in Raqa, some proudly wearing their religion on their sleeves-literally. Many fighters have tattoos of rosaries inked around their wrists and the word “JESUS” printed down their forearms. From an SMC position in Al-Romaniya, its fighters look out over a landscape of buildings perforated with gaping holes, collapsed rooftops and concrete walls spilling into the streets. “The coalition air force carried out intense strikes… This is why there’s a lot of destruction in this neighbourhood,” Seryan says. Aleksan Chmou, a Syriac fighter in a beige cap, says Syriac fighters coordinate closely with the SDF’s other factions. Most Syriac fighters in Raqa are young, like 23-year-old Fadi. “In some neighborhoods, we are on the front lines of the fight,” he says, squinting in the sun as beads of sweat form on his temples. “We received military training and put on this uniform to fight Daesh, liberate our people and all the peoples of this region,” he says, using the Arabic acronym for IS. His fellow militiamen have taken up position in a house overlooking IS-held neighborhoods. As sniper fire and explosions echo around them, some Syriac fighters take a short break to sip tea, drag on cigarettes, or disassemble and clean their weapons. The SMC has even attracted foreign volunteers, with a Briton and an American serving in this unit. 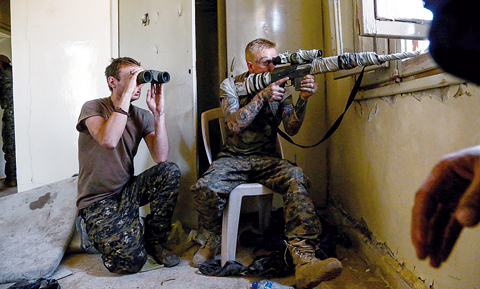 The American-a blue-eyed, blond sniper-aims his rifle out of a window at nearby IS posts as the British fighter behind him looks out with binoculars.